LOUISVILLE – From an early age, Ryan Smith had an interest in the international arena. A graduate of Seton Hall University, he received his masters in Diplomacy and International Relations, focusing on international economics and development and international organizations. Smith grew up attending Fairview Presbyterian Church in Lake Erie Presbytery and began his career teaching English in Germany as a United States Fulbright Scholar. Upon his return to the U.S., he taught German to the business community and worked with faith-based humanitarian, direct service and advocacy in both New York and Washington, D.C.
For the past several years, Smith has been part of a team at the Presbyterian Ministry at the United Nations, serving alongside director the Rev. Mark Koenig. Late last year, Koenig accepted a new assignment as coordinator for Leadership Development, Racial Justice and Network Support with the Presbyterian Mission Agency’s Louisville offices. Smith has now become director and representative to the U.N. with the Presbyterian Ministry at the United Nations. During his time at Seton Hall, Smith was exposed to the work of the Presbyterian church and its connections with the United Nations. The most difficult thing about working with the U.N., according to Smith, is the same thing — patience. Smith believes working with the United Nations provides the church with an opportunity to join the “halls of power” in providing witness and support to the actions of General Assemblies as well as those of partner churches. “My favorite opportunities in my position are working with church partners when they have the chance to visit New York and make connections between our partners and governments, including the Security Council and United Nations agencies,” he said. The Presbyterian Church’s connection to the United Nations goes back to the very beginning, more than 70 years ago. 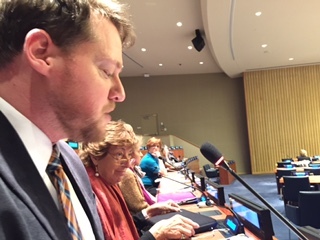 The church holds special consultative status through the UN Economic and Social Council, and has two primary tasks: inspire and equip Presbyterians for global discipleship following Jesus Christ and to advocate for peace and justice based on the policies of the General Assembly of the PC(USA) within the UN community. Smith says it’s been rewarding to see Presbyterians and the Reformed community working together throughout the world. Smith says it is the commitment to communities that inspires him the most and sets the church apart from other non-governmental organizations working around the world. Through its accreditation, the church has the opportunity to participate in the different commissions, conferences and high-level events of the United Nations. The ministry at U.N. has been active with the Commission on the Status of Women, the Commission on Social Development, high-level talks on HIV/AIDS, the Paris Climate Talks as well as the U.N. Youth Forum and other events. Presbyterians interested in engaging with the work of the Presbyterian Ministry at the United Nations can call 212-697-4568.